A 14 mile hike into the Quinault rainforest will lead you to this location and the so called Enchanted Valley. Paul Weeks & I hiked out here for a few days this past summer. After arriving we ate then went to sleep immediately as the rain started to pour. The night was fairly cold and we awoke to frost on the ground and fog drifting through the valley as well as early morning mist rising from the soil and grass. 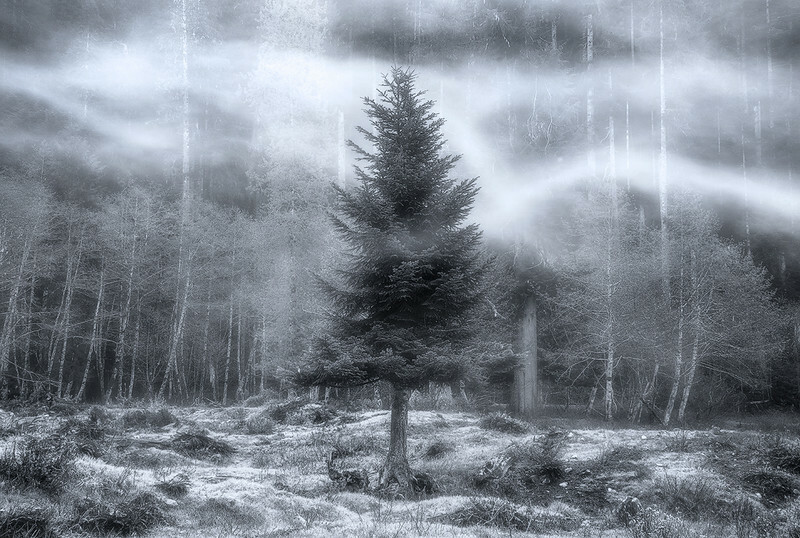 This tree could be seen directly out of my tent door, so I got up and shot it immediately before the fog dissipated. All this atmosphere made for quite a scene. The fog you see in this photo was actually gone within a few seconds. Small patches would roll through the valley very quickly then disappear. The cool part about quickly moving patches such as this is that a long exposure of 3-4 seconds really gives it the feel of movement in the photo. When taking this image I knew right out that it would be in black and white. Rarely does this happen to the degree it did that day, but now that I finally got around to processing the image I feel that it turned out pretty well.